Art museums are not high on my list these days. We’ve seen so many. I could live a long time without ever seeing another Egyptian sarcophagus and contemporary art usually leaves me laughing and perplexed, although we have viewed the magnificent Peggy Guggenheim Collection three times. E basta. But when you wander into Venezia in the middle of the Biennale, it only seems fitting to take in the event. In this, our tenth trip to La Serenissima, we unintentionally coincided with a Biennale year. So we went. Luckily we got the senior discount. The venue at Giardino is lovely. I had no idea there were permanent pavilions. In many cases, the building eclipsed the art. Russia’s site and exhibit were very “1984.” That was our favorite of the paid-for venues. There were some charming pieces around the city that were for public enjoyment. We did not get to hunt down all of them but saw several we liked. A small portion of Russia’s monochromatic installation. Korea’s pavilion. The exterior was the best part. Super-sized and shiny, this rhino contemplates Venezia across the Laguna. Coinciding with the Biennale was an exhibit at the contemporary museums Punta della Dogana and Palazzo Grassi, a first-ever event where one show completely filled both venues: “Treasures from the Wreck of the Unbelievable” by Damian Hirst. Three of Hirst’s pieces were visible in Venezia outside of the museums and they were crazy, huge, classical-looking works of art reminiscent of much we have seen throughout Italy. That drew us in. How could this be contemporary art? One of Hirst’s classical pieces on public display. It is a big joke. Hirst created a fantasy about a treasure trove of items collected by a freed slave, Cif Amotan II (an anagram*) These are wonderfully displayed, many in a before-and-after manner: encrusted with sea life, barnacles, etc., then polished and gleaming after restoration. The Guardian called it “art for a post-truth world.” Click on any photo for a better view and caption. Hirst’s “Demon with Bowl” stands 18 meters (59 feet) tall, taking up the entire 3 -story atrium of Palazzo Grassi. Ric offers a perspective on size of the demon’s foot. A large format statue “found” encrusted with sealife. Some of Hirst’s fictional discoveries. Hirst’s giant clamshell displayed in the historic Punta della Dogana. Another public WOA by Hirst, also near Punta della Dogana. Hirst went so far as to stage elaborate underwater photography of the salvage operation of some pieces. All of the curation supported the myth in detail. Only when one read the fine print about the materials used was the gag given away: granite, marble, resin, MDF, gold, silver…. We thought it was brilliant, although many critics were appalled. Hirst has the last laugh as people are pouring in to see it and reportedly many pieces have sold. I hope so: he spent £50 million of his own money and ten years putting the show together. When you are wildly successful, I guess you can take risks. We stopped on Mazzorbo for lunch at Alla Maddalena. A far cry from Venezia proper. I have to mention a lovely experience we had away from the crazy crowds. This is one of the reasons people should stay longer in Venezia: to get away from San Marco and enjoy the islands where the Venetian Republic was born. A short vaporetto ride from Venezia is peaceful Mazzorbo, incorporating a wine resort, Venissa. Might have to contemplate staying here some time. We often visit the laguna islands, but this time we went to Mazzorbo, specifically for a quiet lunch on a perfect day. While most people head to Burano, we got off one stop early on quiet Mazzorbo. The terrace at Alla Maddalena was full, mostly with people arriving by water taxi. And they were having the taxi wait while they dined! We only heard one other table speaking English. Seemed to be lots of Italians in the know about this place. Prices are reasonable and it was far more charming than the places we usually eat on Burano. No reservation? Plan on eating inside which is where the walk-ins were escorted. My delightful lunch at Alla Maddalena, a mixed seafood grill. Ric had lovely grilled eel. It was a bit of art-focused trip, more so than usual for us. Punctuated by terrific meals and of course lots of walking in one of the world’s greatest cities for wearing off pasta. Newest shopping opportunity in Venezia, T Fondaco dei Tedeschi in a 16th-century building. Can you say high end? Sunrise on the Grand Canal. When “Taxi Ivan” picked us up in Bolzano last week, we could scarcely contain our excitement. We were returning to Ortisei for our 6th summer visit. Ivan remembered transporting us with our cats last summer. The street where we lived, temporarily. So charming! Despite the calendar, it did not feel like summer. Lows of 2 C/35 F and highs of 12 C/54 F were not quite what we expected. We each had to purchase a fleece as a warm layer: our long-sleeved tees and rain jackets just did not cut it. Nonetheless, it felt like coming home. We stayed in the same apartment we shared with our cats, Libby and Jane, last year. Justine and Siegfried at Residence Astoria greeted us like old friends. We were honored to see Justine had purchased our book for use by her guests! Even the staff in the gelato and grappa store recognized us. It really felt great to come back and feel so at home. And my Italian came back rather quickly, if imperfectly. That view looks fake, but it very real. The Sciliar and Punta Santner with Compatsch in the foreground. We managed to carve out two good hikes in our four full days. One was crossing the Alpe di Siusi on a favorite route, stopping for strudel at a preferred mountain hotel. The other a very cold hike through fog across the ridge at Rasciesa. Luckily hot coffee and fine strudel awaited us at the rifugio. Another day we listened to the forecast of rain all day and decided not to risk a mountain expedition, so we took a bus into Bolzano for shopping and lunch. But we never got our umbrellas wet! Not in 36 hours! It looked like rain most of the day so our time at higher altitudes might have been cut short. Hard to know when to believe a forecast. One of our favorite rifugi, Rasciesa. We were the first customers at 9:45. As we were leaving, the crowds were arriving. We cooked several dinners (restaurants get tiring when you travel long term) but treated ourselves to one fine meal at what has become our favorite fine dining establishment in Ortisei, Restaurant Concordia. We were one of only three parties on a Sunday evening, all seated in a cozy room with the woodstove burning. We dithered over many fine options on the menu, choosing an antipasto of involtini with mozzarella and grilled vegetables and secondi of venison and pork, with a fine local Lagrein to accompany. Everything was superb! The owners are wait staff and chef, making for a very personal experience. They were thrilled to hear we returned to them after a great experience last year. It is so nice to go to restaurants away from the main streets, no matter how small the town, and find such intimacy. Here are a few more pictures from our stay in Ortisei. Click any picture for complete captions. The path approaches Rifugio Rasciesa. Some time we’ll have to spend a night here. The fog rolls in-and-out along the trail. Very cold this day, 2 degrees Centigrade! Another magnificent and almost unbelievable view. An entrepreneur set up an honor store along the trail. Each item €5.00. I told Ric this perspective makes him look like he is in a diorama! Taken near Hotel Icaro, Alpe di Siusi. On our way from Mont Seuc to Compatsch. Cold enough for gloves! We shared a mid-hike strudel at Hotel Icaro. So civilzed to find good coffee, food, and a restroom along the way. The canal where we live. We are now in Venezia and the weather gods have cooperated. We were out in shirtsleeves and ate lunch al aperto twice this week. Venezia is, of course, very familiar to us. We’ve been here 10 times although I am not sure we should count our one-night-stand in August of 2016 when we came here simply to briefly escape the heat in Roma. We know where we are going most of the time although I am grateful for GPS on the phone when we get twisted about. The first few times we visited we used only paper maps. I am happy to have adopted the electronic form when I see others standing around gaping at their maps trying to decipher Venezia. Incredible saute of mussels and clams at Trattoria da Jonny. It was another fine meal we got ourselves into at Trattoria da Jonny. Or rather, I should thank Michele over at Meandering with Misha for getting us there. She raved about it in March and I remembered her post was so inspiring we had to go. We were shocked to arrive and find the place lightly attended while out on the main tourist piazzas things were humming. It was to our advantage: a finely prepared lunch in a peaceful location with only schoolkids and local shoppers passing through. We kept it simple: branzino with spinach for Ric, a lovely bowl of mussels and clams for me, accompanied by seasonal veggies and roasted potatoes we shared. A little Soave washed it down nicely. A lot to eat for lunch but after our three-plus mile morning walk (and knowing we’d do four more miles before the day was finished) we deserved it. Again we are preparing food a casa so a simple salad and more good wine (Donna Fugata why are you not exporting to the U.S?) made a fitting evening meal. Giant hands support a building along the Grand Canal. Interesting metaphor. In addition to eating at several new-to-us places, this is turning out to be an art tour of Venezia as we finally attended the Biennale. More on that later. Always new things to see even in a place you’ve visited many times. We return frequently to our favorite places. We find the mix of familiar and foreign compelling. So once again we ventured to Venezia, one of the top destinations in Italy for us. We were thrilled, even on our 8th visit, to walk out of the train station and find the Grand Canal at our feet. For those who think Venezia is Disney-esque, has bad food that is over-priced , or is filled with same-old-same-old sites, even after so many visits we made discoveries that deepened our love for this unique city on water. New-to-us sites: Scuola di San Marco and Casino Venier. La Scuola di San Marco is a medical museum located near the entrance to the public hospital. Go if only to see the room in which it is housed, a masterpiece in itself. Casino Venier is hard to find. It is a salon, a type of entertainment lounge frequented in the 18th century by the likes of Casanova. Our friends were inspired to select these sites by a Guardian article, “Top 10 free things to see in Venice,” exposing us to some new sites. Despite the title there was, however, a charge to enter the museum. New-to-us restaurants: La Promessi Sposi, Impronta Cafe, and Osteria di Santa Marina. The first is a small trattoria, crowded, with simple but delicious food, at prices that will make you doubt you are in Venezia. Do make a reservation. The Impronta is a busy lunch stop, so again a reservation makes sense. Here you will find Venetian business people dining on simple fare including salads and sandwiches. Osteria di Santa Marina is fancier, a place to celebrate and a bit of a budget-buster. Excellent food, classic service, a fine place to observe a special occasion, like Ric’s birthday. We have been using this list from The Telegraph to inspire our dining in Venice for a couple of years. So far no losers! This post is long on pictures and short on words. We introduced good friends from Portland to the wonders of Venezia and completely enjoyed renewing our love affair with La Serenissima. Click on any photo for a better view, full caption, and a slide show, if you like. Riding the Lion of Venice. Here I am, a bright spot on the canal. The campi (Venetian for piazzas) are playgrounds. Canal bridge, near St. Elena. John & Janet enjoy a romantic gondola ride. One of our favorite Venetian street sculptures. Would you believe this is marzipan? Beautiful reflections on SS Giovanni & Paolo. Cute window display of jewelry trees. Arsenale early morning. We love to go out and walk as the city wakes up. This little guy was waiting for someone from the church to set out food. When you go back to a place during a different time of year, you see different things. In the Frari Church a relic was displayed in this Baroque altar that is only open during Holy Week. It is said to be the blood of Christ. Misty Santa Maria della Salute. Basilica of SS. Giovanni & Paolo in the sunrise. Dinner with friends at a Venetian favorite, NoNo Risorto. The pigeons were keeping this little girl occupied. View from San Giorgio Maggiore. I never get tired of going up here. Can you see the mass of people in Piazza San Marco? Table on a canal. What a romantic dinner spot! Moon over the canal, view from our hotel front door. Classic Venetian palazzo in a side canal. Bridge of Sighs as a background. Not bad. So many people plan their trips to Italy in spring, summer or fall, but we have found off-season travel to be a real benefit to living in Rome. 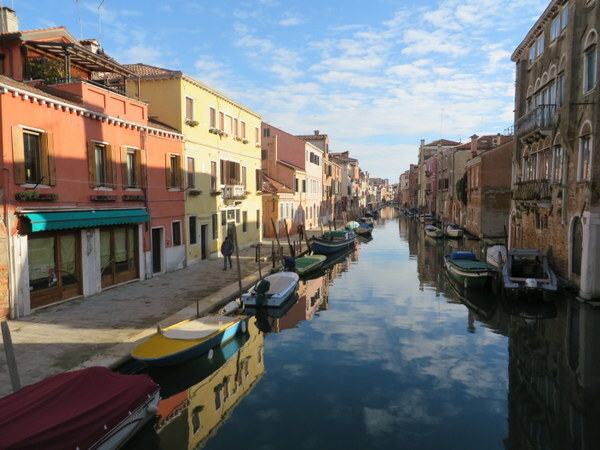 This was our sixth trip to La Serenissima – our third in a December — and it certainly will not be our last. There are experiences to repeat each time (we always go to Murano) and seemingly endless new ones to add, whether a museum, a neighborhood, or a restaurant. This time we went to the Correr Museum for the first time largely because they had a special mostre “The Poetry of Light: Venetian drawings from the National Gallery of Art in Washington, D.C. “ The Correr is a terrific, complex and comprehensive museum. Set in a 19th century Napoleonic-era palazzo, with a wing that dates to the 16th century and the Republic of Venezia, the buildings dominate Piazza San Marco and this time of year are seldom-frequented by tourists who are busy in the Piazza and queuing for the Basilica and Doges Palace. Surely those two edifices are worthy of attention and we have visited them multiple times, but what fun to see the Piazza from this new perspective as well. The Correr has an amazing view over the Piazza from the south and we enjoyed watching people splashing about in the acqua alta that occurred this day. Wading through Piazza San Marco. Boots of many colors…only €10. Acqua Alta in Piazza San Marco. Completing what we came to call our Museum Day, we made a repeat visit to the Guggenheim, which we had last visited in 2012. This was one of the busier places on a Sunday, mostly Italians, many educating their young children, providing a view into modern art with careful observations. Picasso, Max Ernst, Calder and Pollock keep company with Miró, Dali and Magritte among others. The location right on the Grand Canal could not be better. Imagine Peggy hosting a dinner party here! 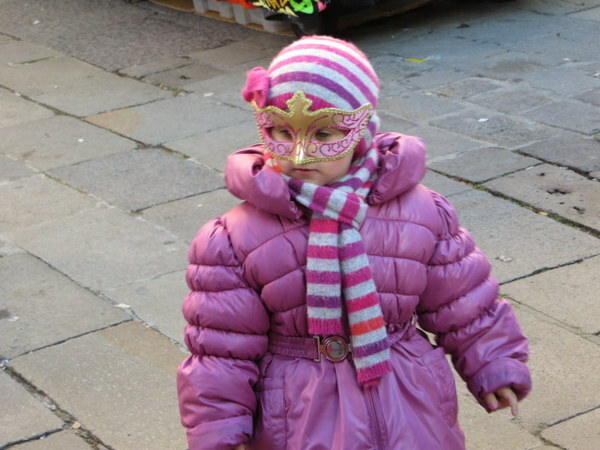 Not yet Carnivale, but this little cutey has her mask. Day two was our Urban Hike Day in which we wove together three walks out of my favorite Venice guide, “24 Great Walks of Venice.” This sunny and mild day we wandered in temperatures approaching 60 F (16 C), snapping photos and enjoying the almost deserted calli, bridges and canals. You’d think in 4 hours of walking we would have covered the entire island, but we found ourselves saying “Gee, we haven’t been to Sant’Elena or out to San Giorgio Maggiore, or the Guideca.” In fact, we have not even entered the Basilica of San Marco in two years, despite 3 return visits in that time. Outside a mask maker’s shop. The Borg have arrived. Not your traditional Carnevale masks…. Our street. We’ve found a little apartment we like and have stayed there 3 times, in a quiet calle where we can masquerade as locals. Building decor. This statue mocks someone who fell out of favor with the Republic. You would never guess that Piazza San Marco was less than a 20 minute walk away…and crowded. View across Murano to the snowcapped peaks. Day three dawned brilliantly sunny if chilly to start, but it made for a terrific day to visit Murano and do some shopping. I have a favorite glass artist there, Giorgio Bruno. He is a maestro and creates lovely jewelry, glassware, and decorative items. By now I have a nice collection of items as we have been there 5 times. Giorgio and Michela invited us in for coffee and a visit before I got down to shopping. As always Cindy the dog was a love. She really took to Ric in a special way. Too bad I didn’t take a picture. We also went in search of new restaurant experiences. I have heard over and over that Venice is expensive and has bad food. That is not our experience at all! From a random bar near the Frari Church we had fat and tasty sandwiches. At a rustic little taverna in a sottoportego we once again had our favorite pizza in Venice. Traipsing halfway across the city one night (which is not as far as it sounds) we feasted on delectable baked turbot, expertly boned and served in a place bursting at the seams with locals but few tourists. As we have some go-to places after all of these visits, this trip we challenged each other to find new experiences and scored new two repeatable spots, Ai Artisti in Dorsoduro and Alla Palanca on the Guideca. Ric found a list of Venetian restaurants from the London Telegraph and our only disappointment was that some of them were closed on nights we had available. BTW, Alla Palanca is best for lunch. The chef goes home at 14:00 and there is no hot food at night. The Christmas lights came on December 8. The Immacolata marks the start of the Christmas Season. Tree in Piazza San Marco. In Venice, Santa rides a gondola. We have spent 24 nights in Venice since our first visit in 2010. Will we go back? You bet! We still have not climbed the Campinile in San Marco, there are several promising restaurants still on our list, and no doubt Giorgio will have some new bauble for me. Plus he promised to take us out to lunch the next time we visit! We love Venice. We’ve now taken five trips there since October 2010 and we are already discussing the next one…. This time we had the opportunity to see La Serenissima through the eyes of a thirteen-year-old and it was great fun! Aubrey made us go on a gondola. we are indebted to her! Our friends came from Washington, D.C., and rather than letting them crash in Rome, we whisked them off to Venice on the high-speed train. I think this can be a good way to arrive in Italy from the U.S. We’ve done it twice ourselves: Land in early morning in Milan or Rome and take a Freccia train to Venice, allowing for a catnap and time to lunch on the train, then settling into B&B or apartment and freshening up with a shower. By this time you are sufficiently revived to hit the calli of Venice and take a walk to get your bearings in the daylight before an early (for Italy) dinner about 19:00. After a good night’s sleep you are practically adjusted to local time by the next morning. You cannot see everything in Venice in a couple of days, but you can get a good taste of this unique locale. We did a pretty good job of covering territory, walking about 6 miles (9.6 km) each day, first through San Marco, San Polo, and Dorsoduro on Day One, then through Murano and Burano on Day Two. Of course we visited favorites: Frari Church, my jeweler on Murano, the tower at San Giorgio Maggiore. But Ric and I try to do something we have never done before each time we visit Venice. This trip, at the urging of our young friend Aubrey, we added gondola ride to our experience list. I have always thought the gondola a dorky, touristy thing to do, and it probably is, BUT it was really fun to see the city from a different angle and in the back canals. I think it may be even more fun as a group than as the iconic romantic ride for a couple. As a result, we very well might do it again the next time we take friends or family to Venice. Rick and Jane, are you ready yet? Below, past the insane cruise ship photo sequence, are a few more pictures of our trip. 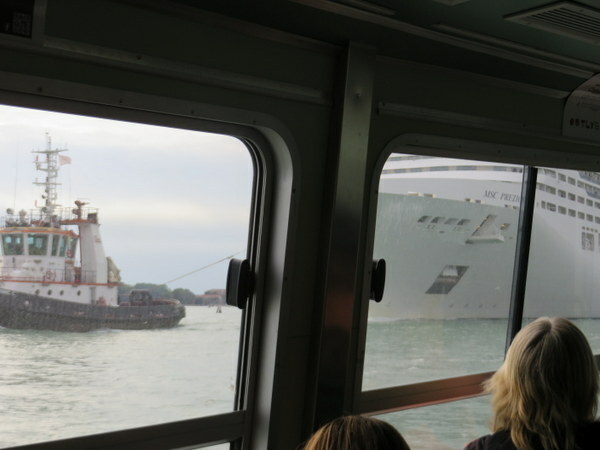 The following three photos illustrate the insanity of letting cruise hips sail throughu Venice in the Giudecca Canal. 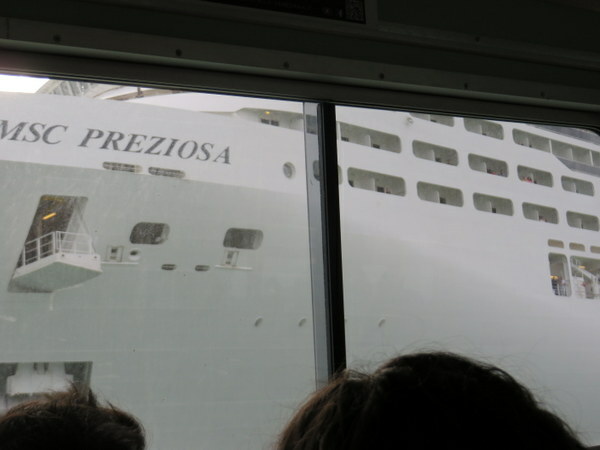 As we approached San Marco in a vaporetto, this cruise ship was making its way into the Bacino to go out to sea. 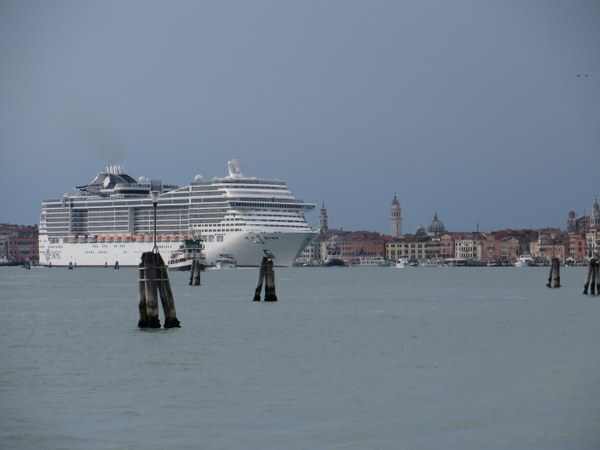 The all-too-big ship pulls alongside our “water bus” or vaporetto. These things are just too big. Starting in November, the biggest are suppose to be banned. It was frightening to see how close they can come to other water traffic. Click any image below to see a slideshow. Libby lays claim to Ric’s suitcase as he packs for Venice. Arriving back at our apartment in Venice one afternoon, we saw this dress hanging out the window, like a piece of fabric art. Our gondoliere, Paulo, steers us along the canal as Aubrey and Kim enjoy the ride. The shops even decorate the windows that are only seen by people passing in a gondola. Iconic Lion of Venice in San Marco. Kim, Aubrey and John ham it up in the courtyard. We rented a large apartment near San Marco and loved it! In a city of architectural wonders, these stairs are from 1499! Maestro Giorgio Bruno with me outside his studio on Murano. We visit him every trip. I encourage you to drop by, too. Cross the green bridge and turn left away from the majority of shops. Why do we find laundry hanging out a window so picturesque? Aubrey sports her new heart from Giorgio Bruno. Aubrey was afforded the opportunity to blow a glass bulb. Giorgio treated us to a demonstration of his glass-working skills. Two piccoline in pink enjoy gelato in a Murano doorway. Although the weather was not the best. we thoroughly enjoyed our ride through the canals. Kim and I engage a gondoliere in negotiations for services.